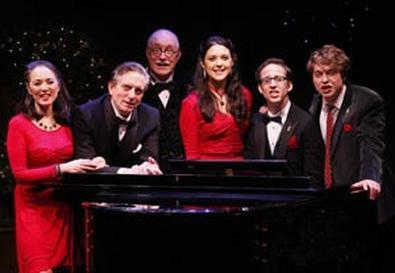 For a light holiday diversion, you can't get much lighter than the Irish Repertory Theatre's concert adaptation of Dylan Thomas' "A Child's Christmas in Wales." Running a swift 75 minutes, this confection emphasizes the sentiment and the saccharine in Thomas' classic of yuletide memories from his boyhood in a Welsh village, defanging his biting humor and softening his hard edges. Director-adapter Charlotte Moore, who is also the theater's artistic director, intersperses traditional and original seasonal songs with Thomas' text. In each sequence of young Dylan's Christmas adventures, Moore goes for the broad laugh rather than the shaded observation. One piece of staging is particularly telling. A gang of kids is caroling in front of what they consider to be a haunted house when a dry "egg shell" of a voice from within the scary domicile joins them and they run off in terror. Moore has the source of the voice played as a terrifying monster—how the children hear it—rather than as a lonely recluse. Thus, the sequence is a funny joke about a prank backfiring rather than a moving vignette about an attempt at human contact. But Moore was obviously going for chuckles and warm fuzzy feelings to go with the holiday season, and she accomplishes this goal. The concert is the theatrical equivalent of unspiked eggnog—sweet but not very strong. A nimble cast of five divvies up the speaking and singing duties, and John Bell provides sturdy musical direction and piano accompaniment. Ashley Robinson gives a perfect rendition of a small boy enumerating an endless wish list in "I Don't Want a Lot for Christmas." The veteran character actor Simon Jones ably transforms from mischievous tyke to pipe-smoking uncle. Victoria Mallory and Kerry Conte lend their golden voices to many carols and vivify loving mothers and eccentric aunts. Martin Vidnovic's robust tenor can be a booming trumpet or a soothing murmur. The evening ends with a medley of familiar Christmas songs sending the audience out into the cold. It's a bracing and straightforward finish to an overly sweet holiday celebration. Presented by and at the Irish Repertory Theatre, 132 W. 22nd St., NYC. Dec. 12–Jan. 2. Tue.–Sat., 8 p.m.; Wed. and Sun., 3 p.m. (No performances Tue., Dec. 14, and Sat., Dec. 25; additional performance Sat., Dec. 18, 3 p.m.) (212) 727-2737 or www.irishrep.org.